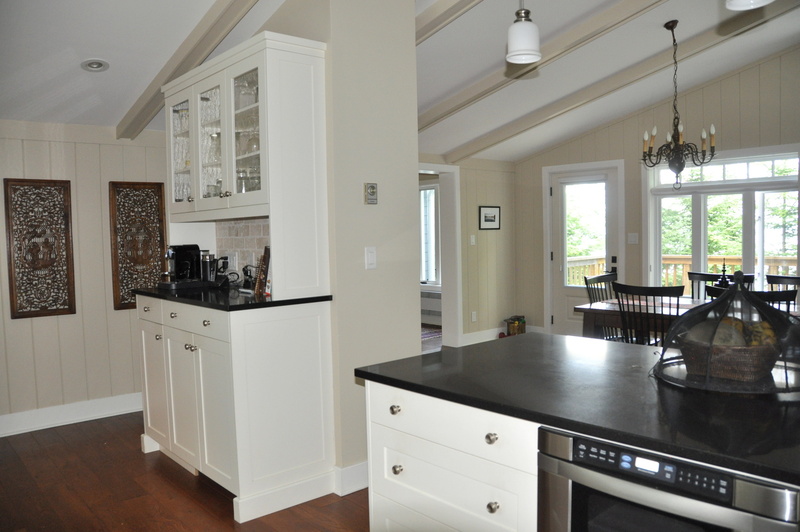 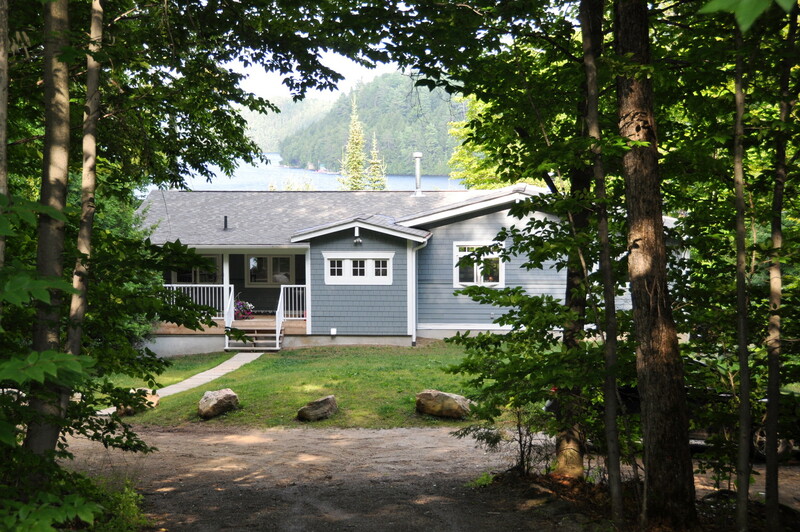 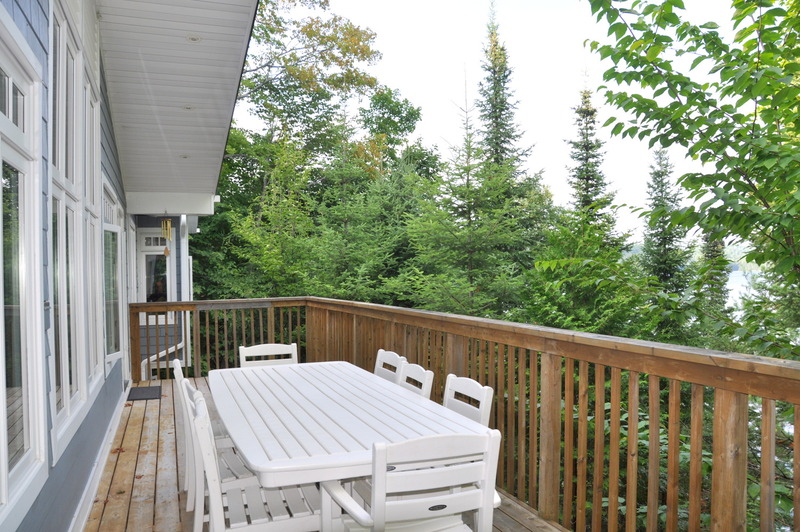 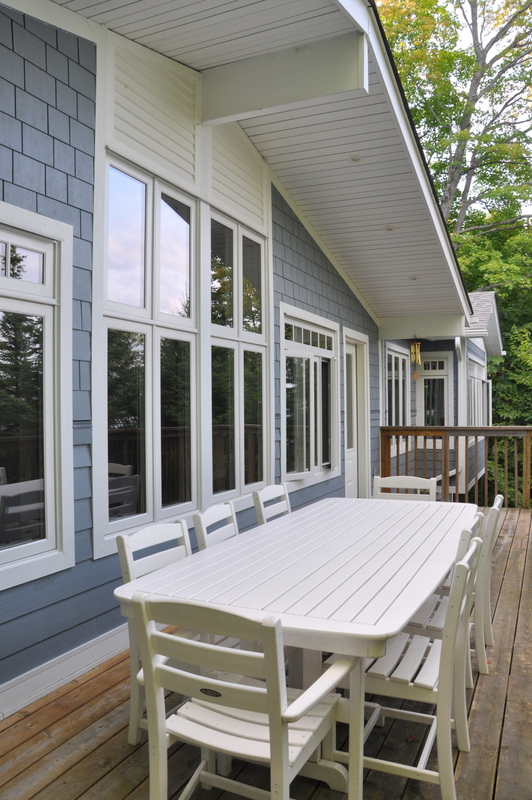 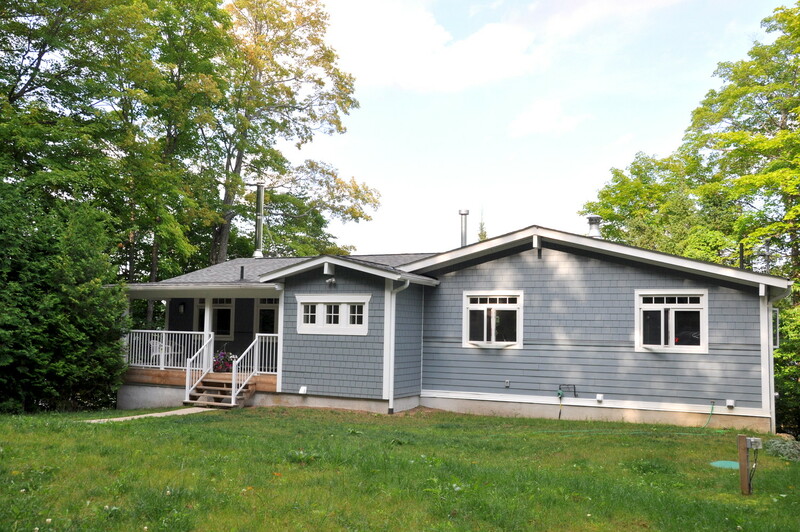 This beautifully decorated, 5-bedroom cottage sits perched above the clear waters of Kawagama Lake, recognized among the cleanest lakes in Ontario, with a spectacular view across the lake and neighboring islands to the rolling hills of Algonquin Park in the distance. 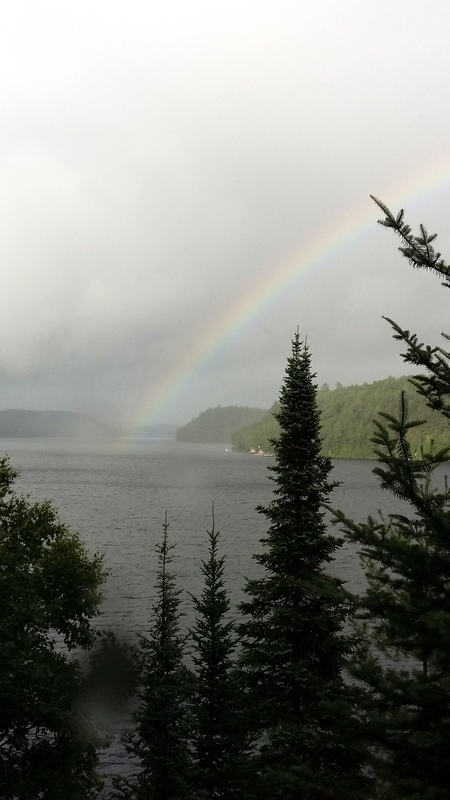 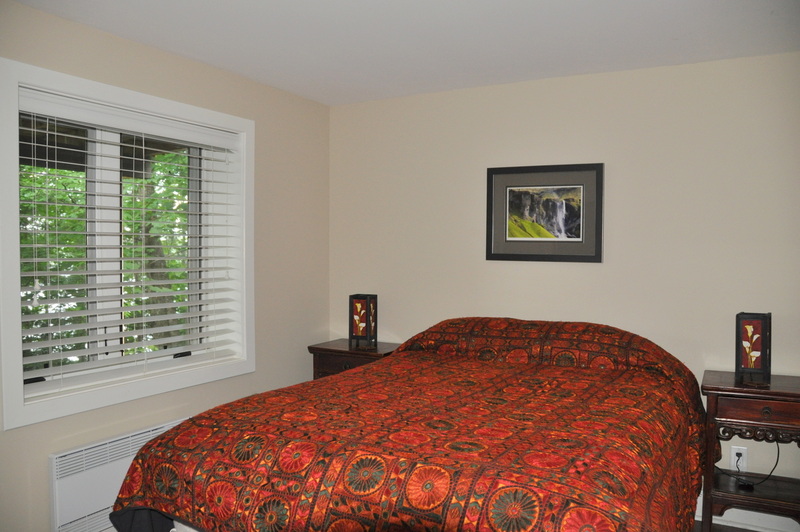 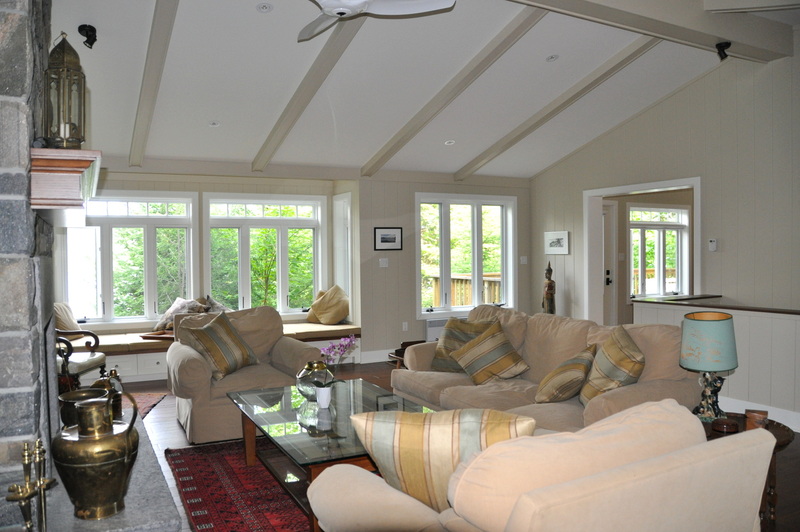 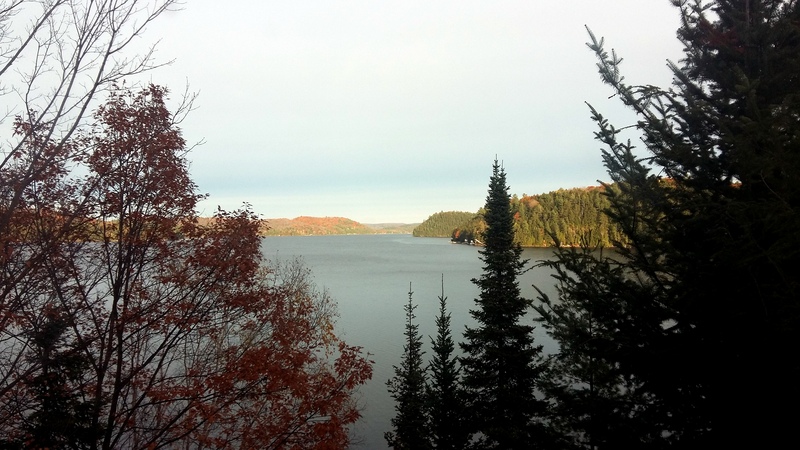 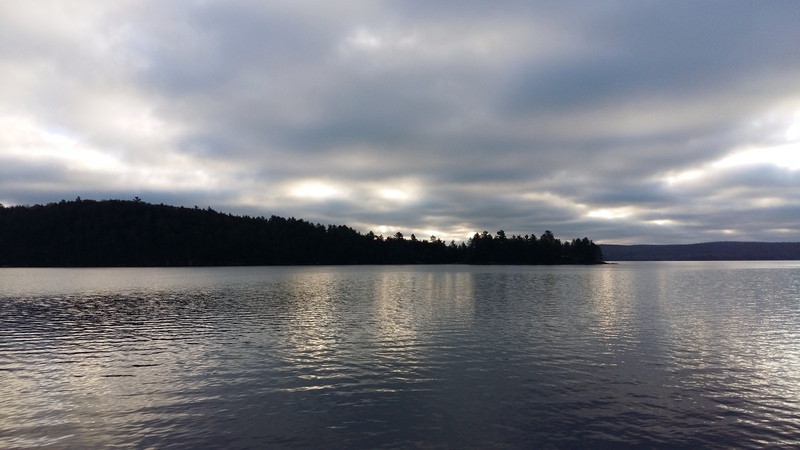 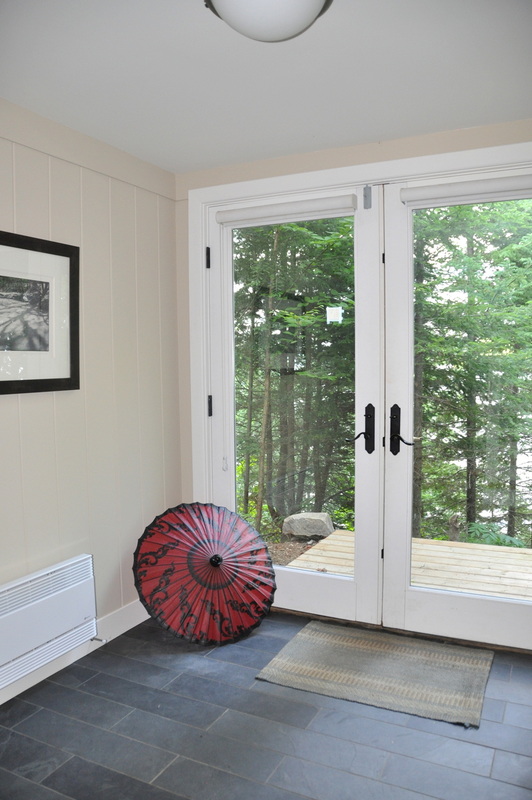 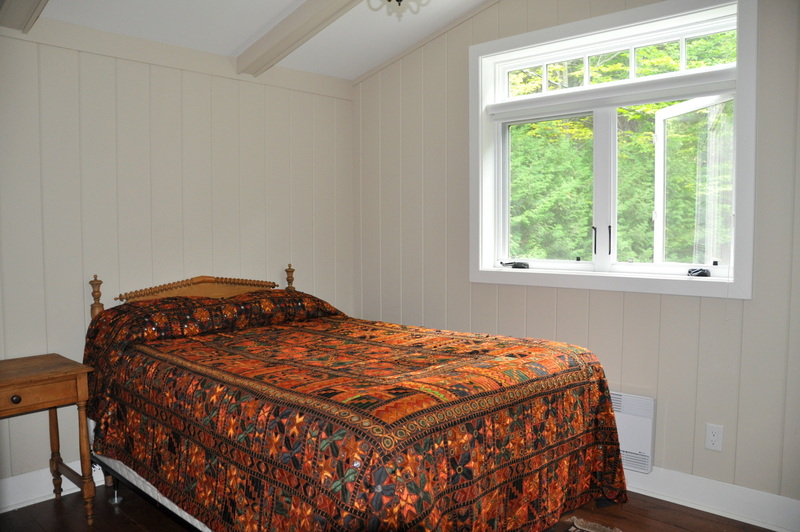 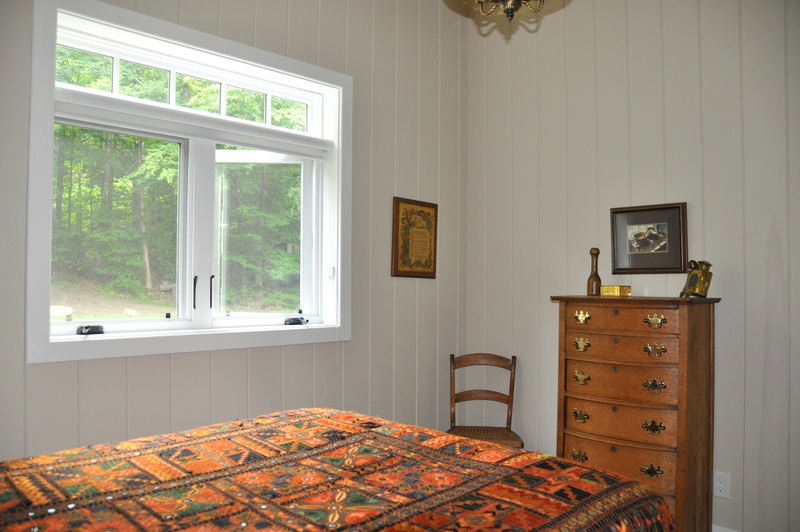 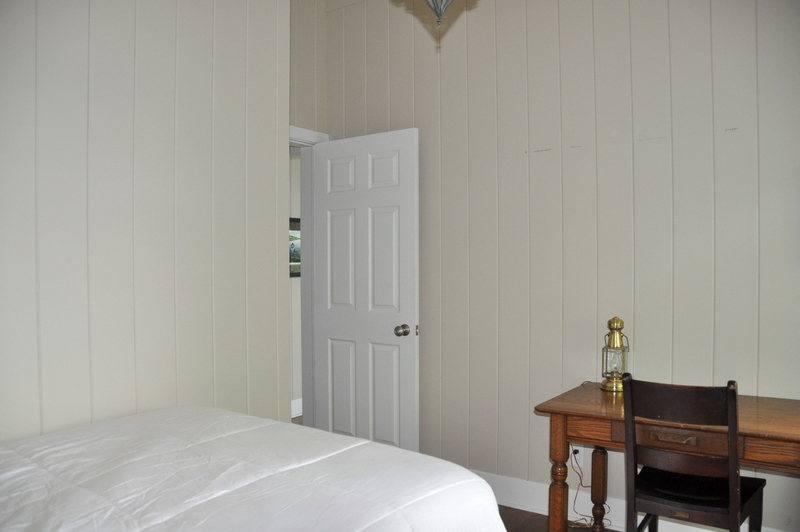 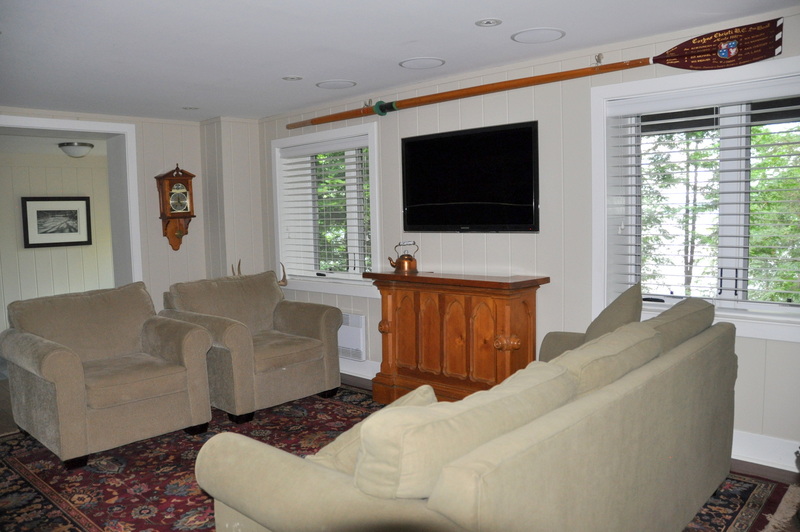 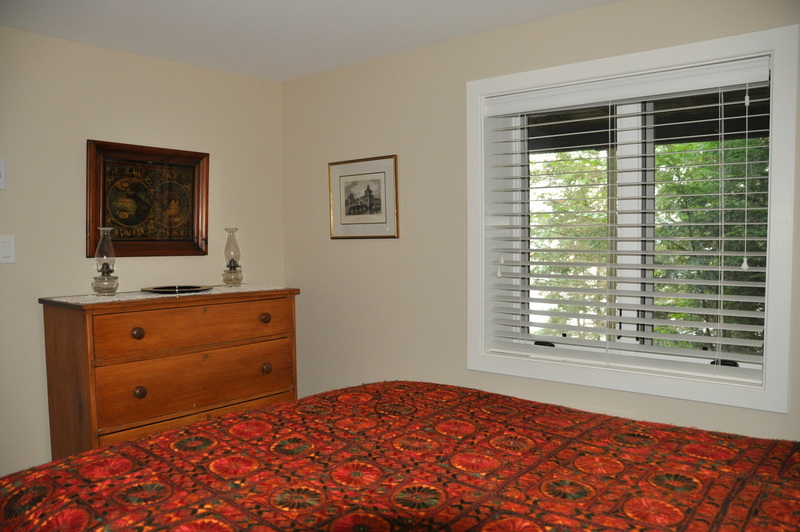 Located in the County of Haliburton (bordering the east side of the District of Muskoka), the cottage is a 25-minute drive from the charming village of Dorset. 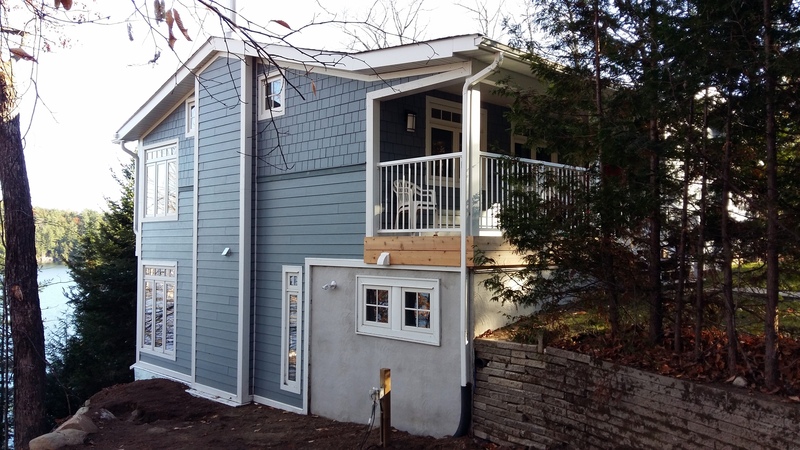 A major addition was completed in October 2016, which nearly doubles the size of the cottage to 2,800 square feet. 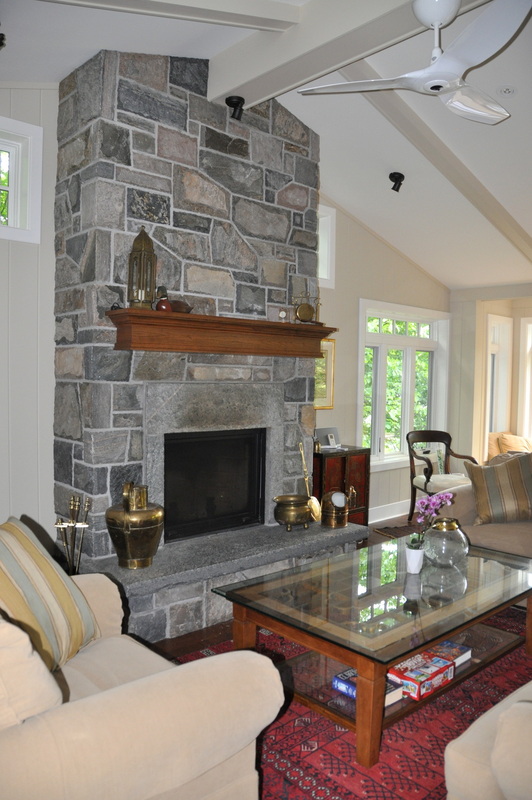 A combination of Oriental and Canadiana décor, design motifs, and art reflect the owners’ lives and work in Asia and roots in Canada. 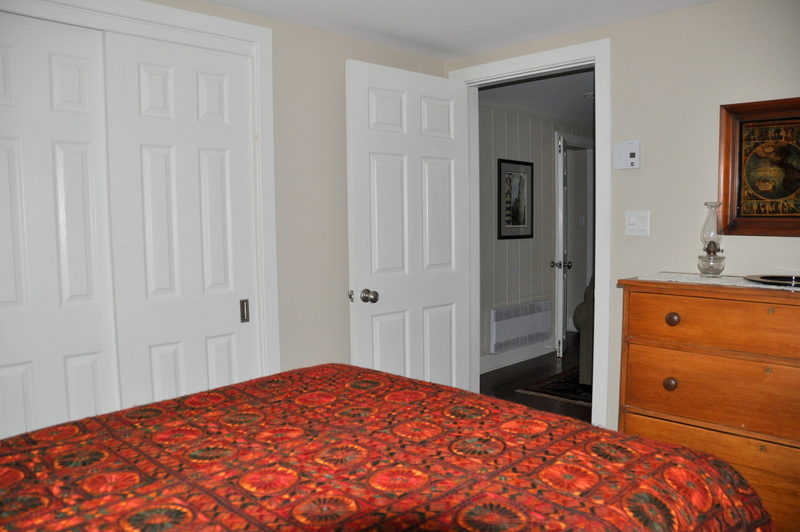 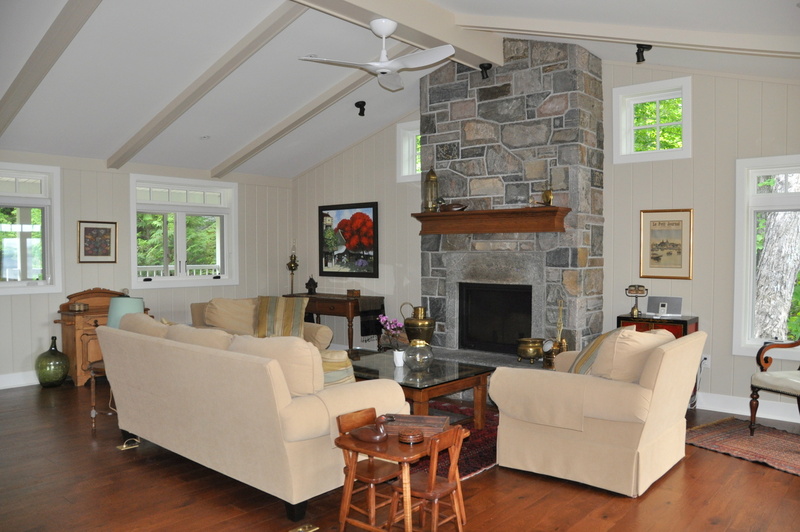 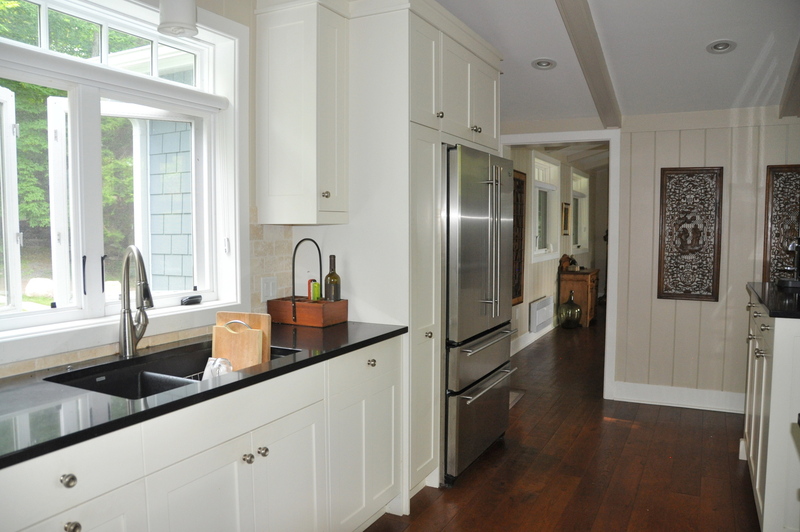 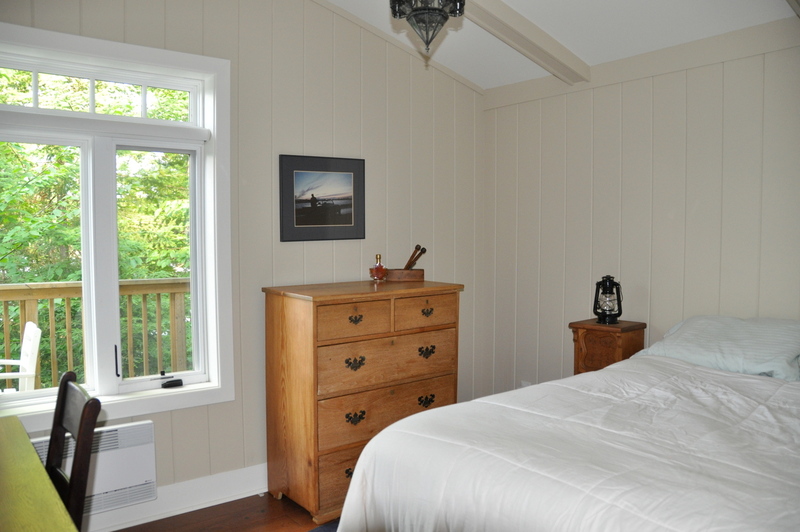 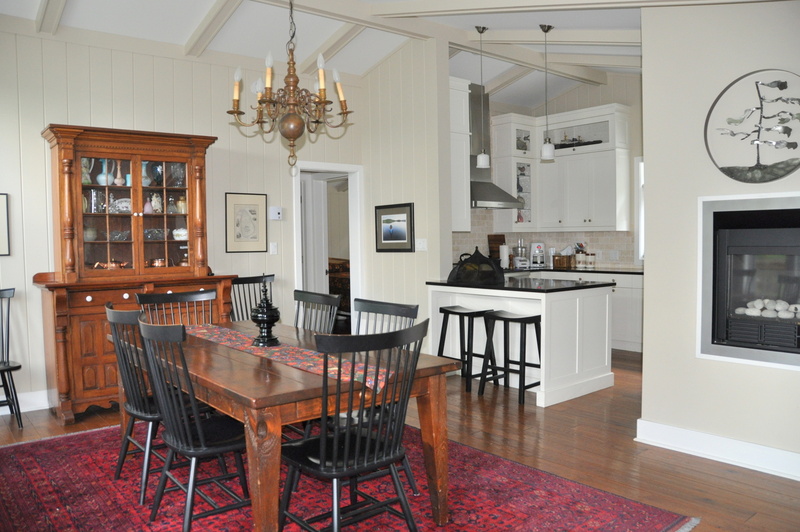 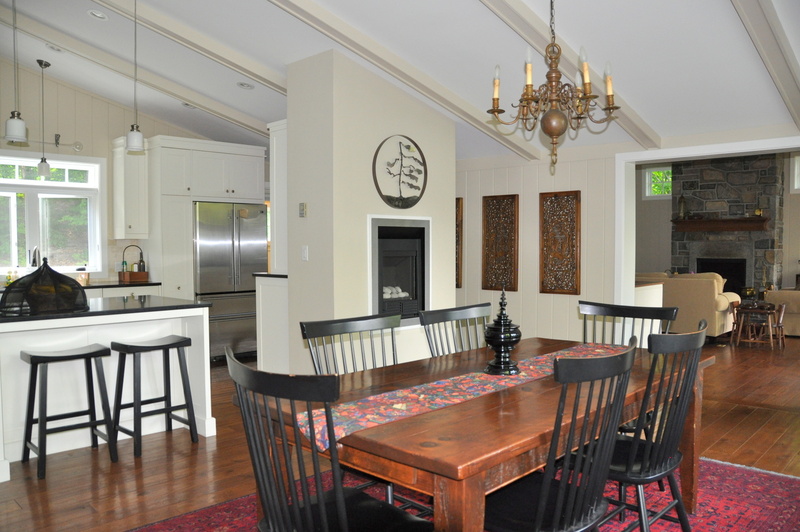 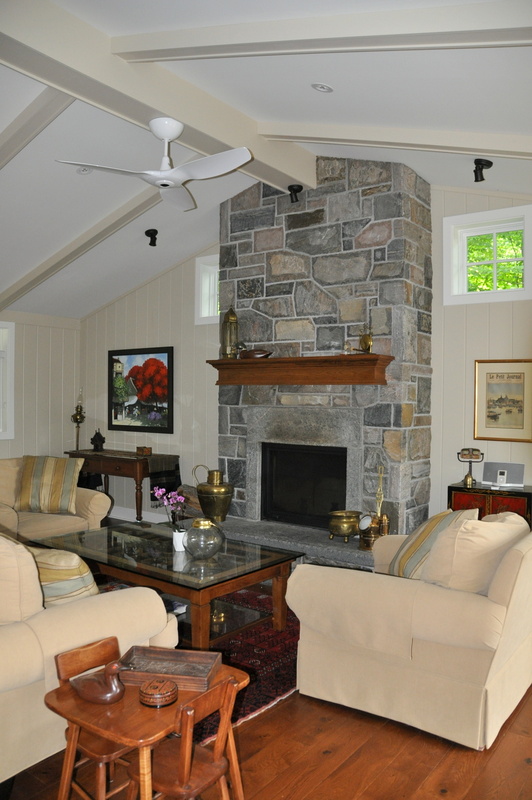 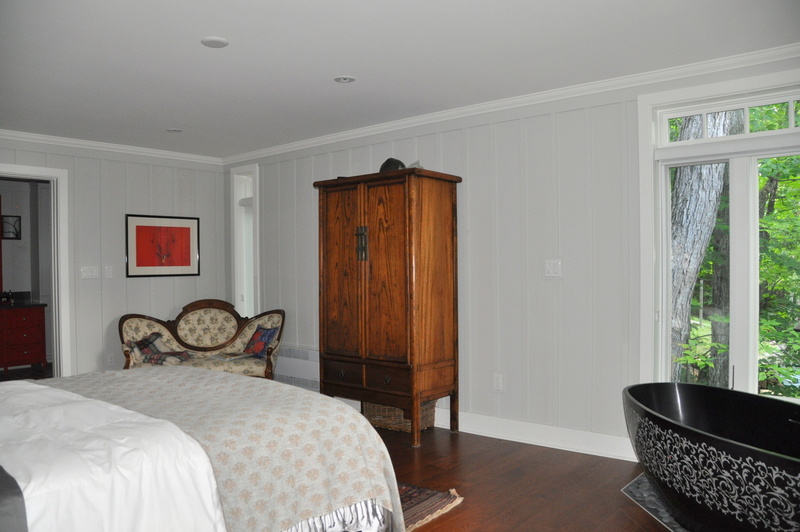 In the event of a power failure, a well muffled standby generator automatically starts up and powers the entire cottage, including appliances and the water system, until electrical service is restored. 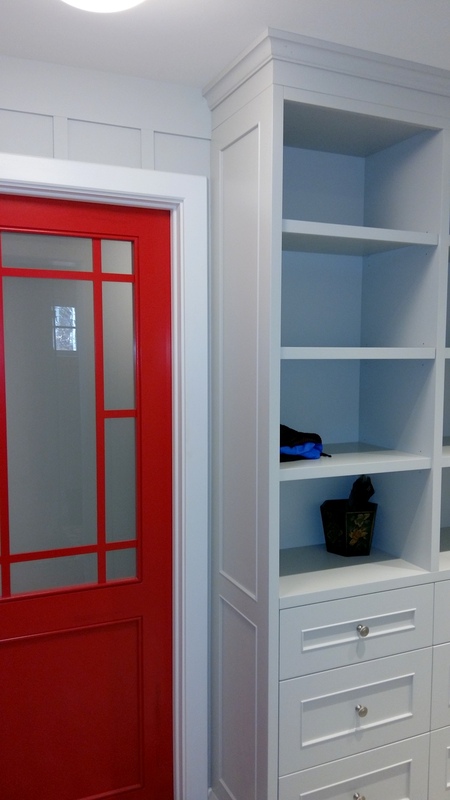 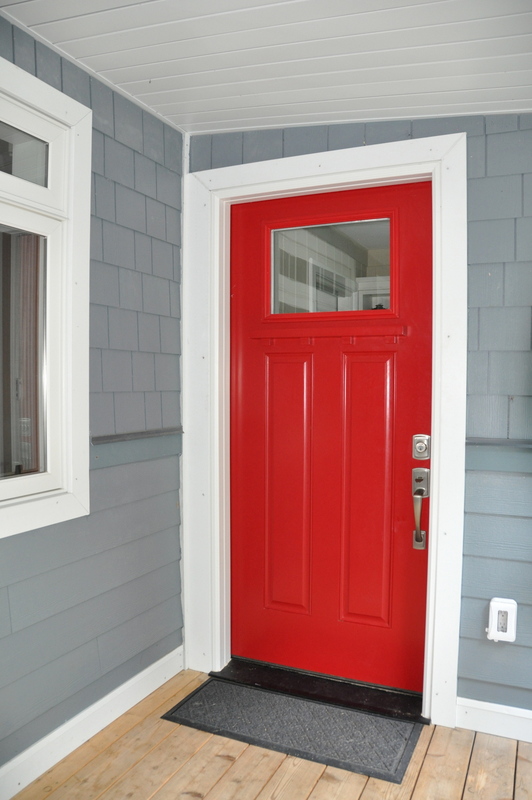 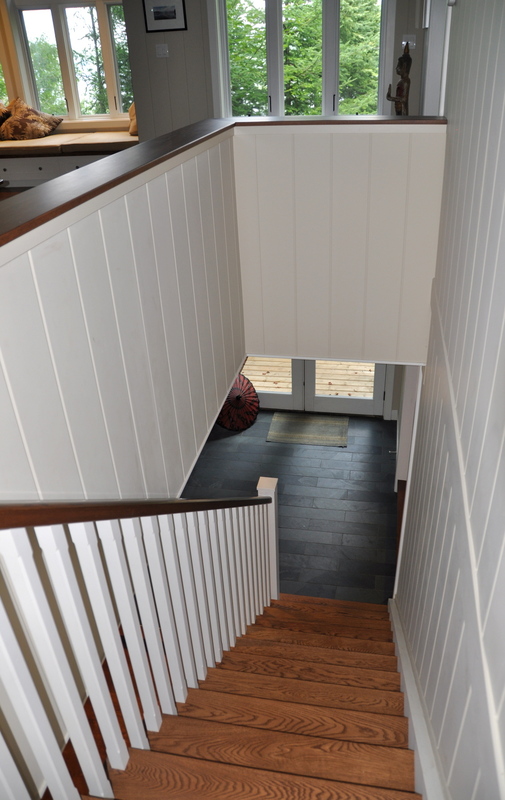 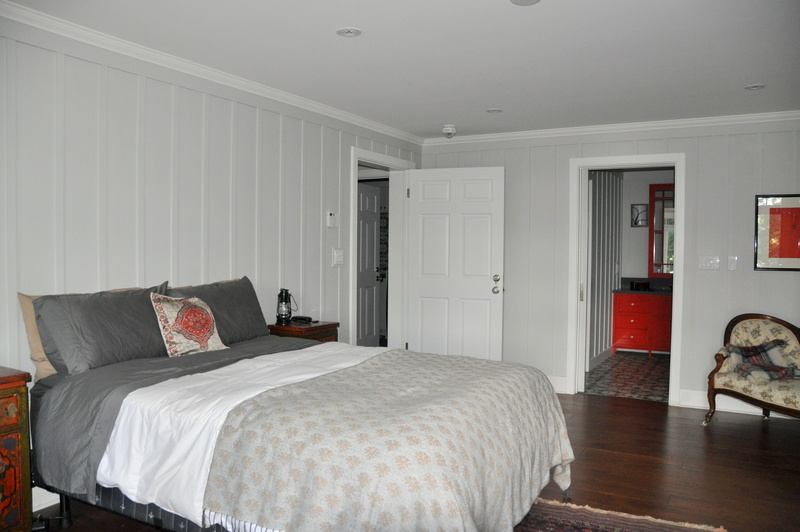 Entered through a red door and a mudroom with beautiful custom cabinetry, the open concept main floor features peaked ceilings, warm oak flooring, and wood-paneled walls. 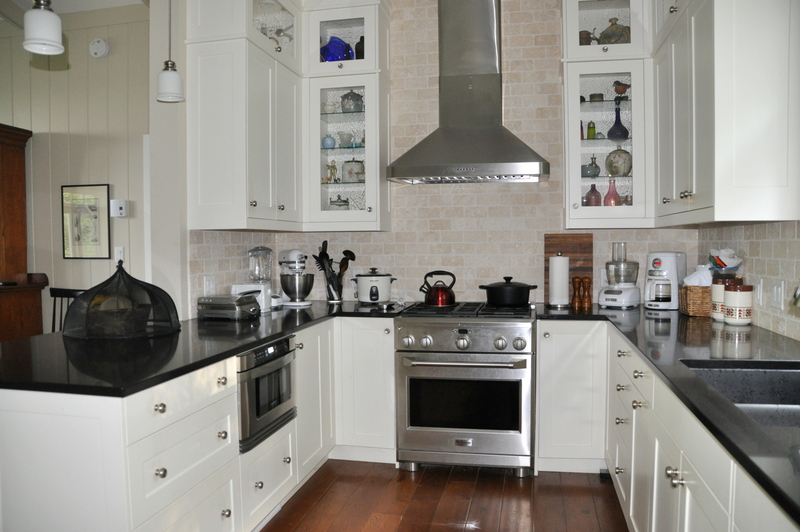 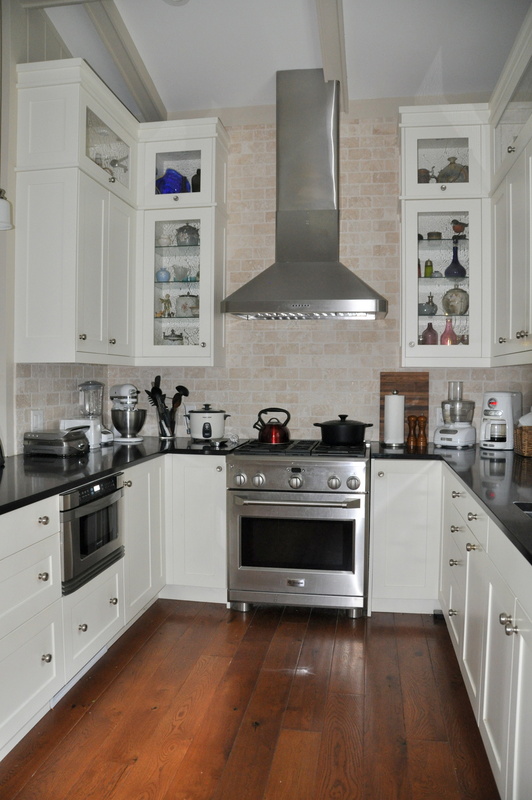 The beautiful kitchen includes fine cabinetry, high-end appliances, virtually every cooking accessory needed to produce gourmet meals, a peninsula countertop that is a perfect gathering place for preparing meals with friends, and a separate bar counter and cabinet. 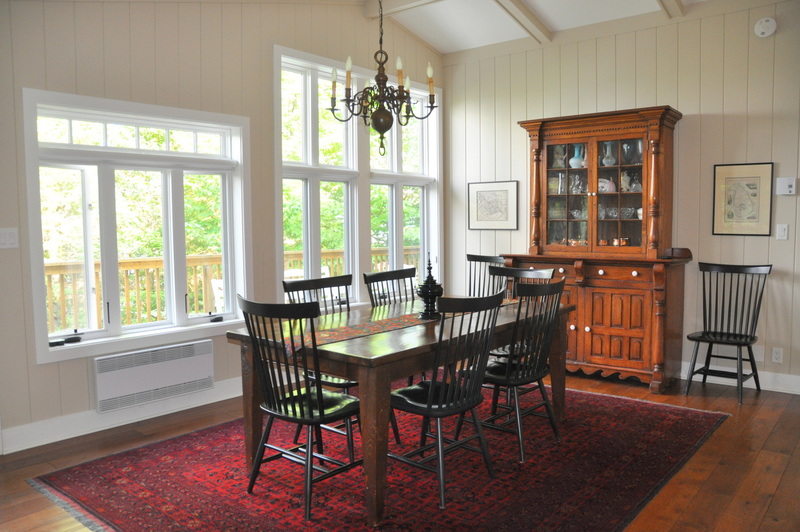 The kitchen opens to the dining room, where a beautiful harvest table sits atop a Central Asian carpet, flanked by an antique pine hutch. 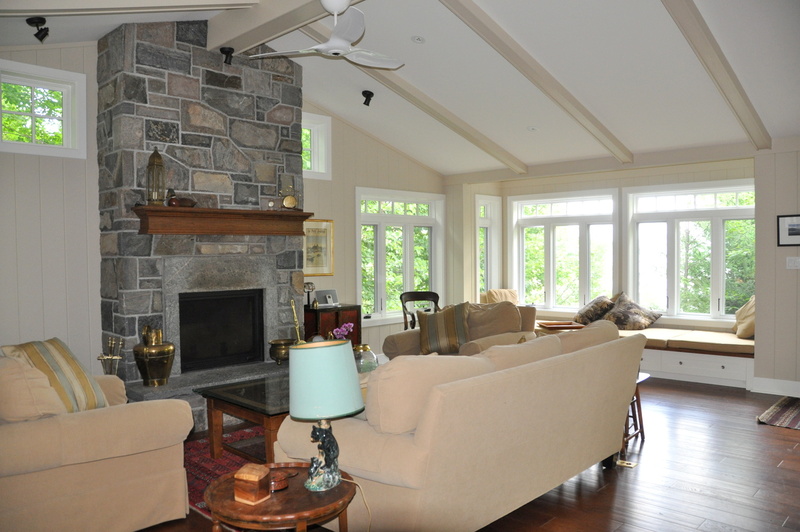 Accessible from the kitchen and dining room, the living rooms feature a peaked ceiling, a beautiful raised-hearth fireplace trimmed in Algonquin stone, and spacious window seat with a stunning view of the lake—a magnet for conversation over morning coffee or curling up with a book. 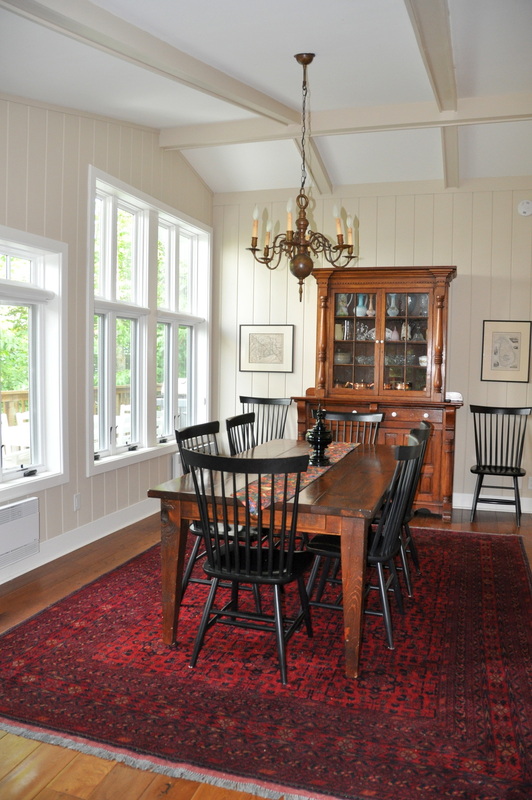 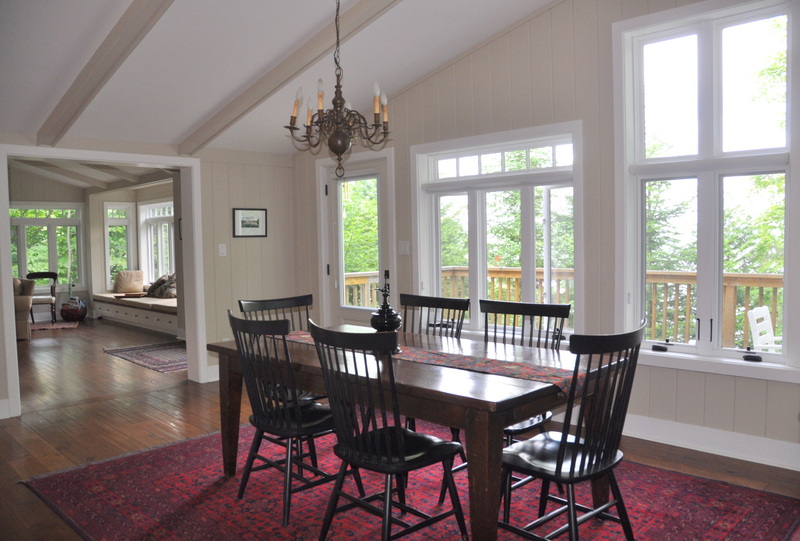 Large windows across the lakeside front of the cottage allow for plenty of natural light and lake views from the kitchen, dining area, and living room. 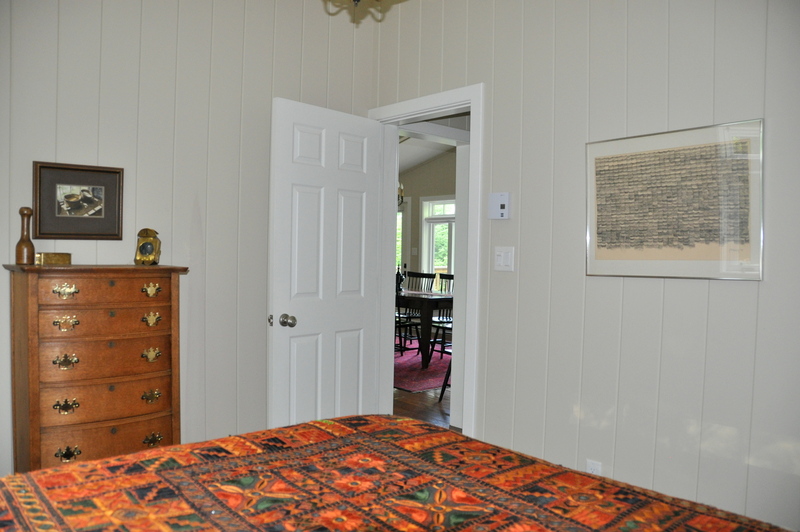 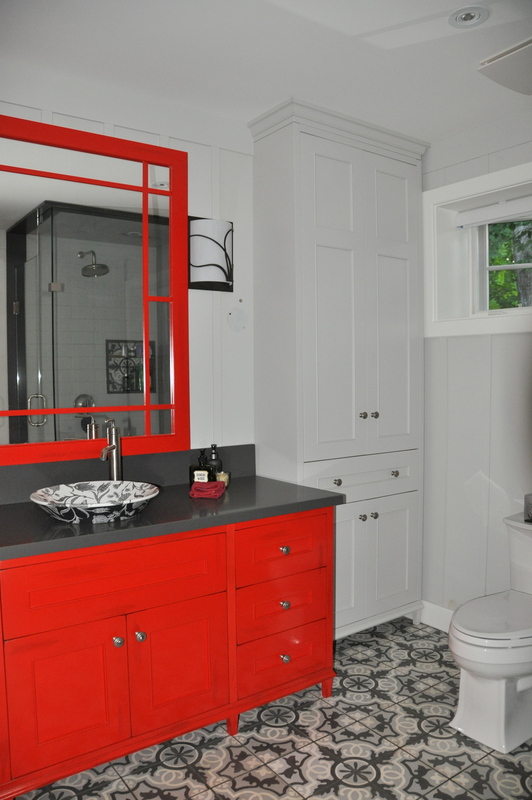 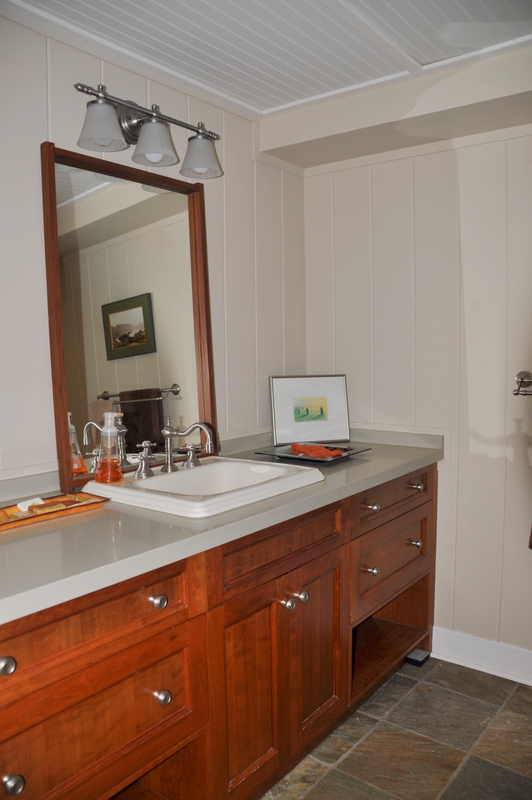 Two bedrooms decorated with Canadiana furniture and a four-piece bathroom with lovely cabinetry complete the main floor. 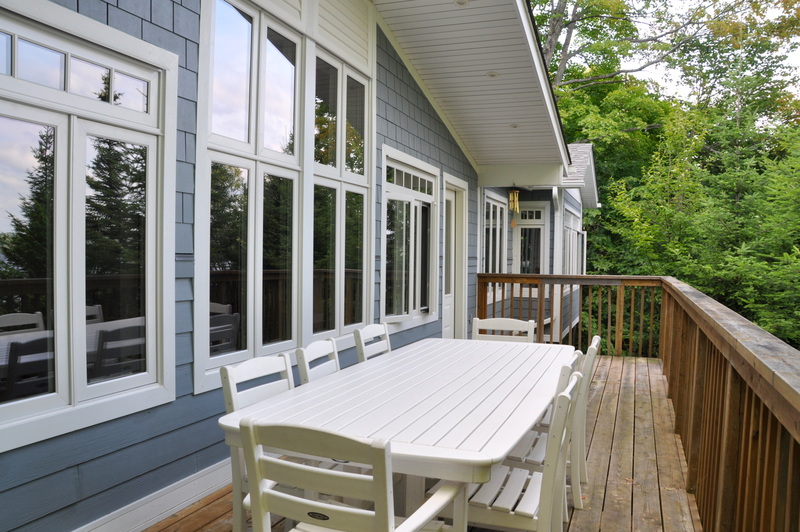 With table seating for eight, the front deck is perfect for a sundowner or dining with a view of the lake. 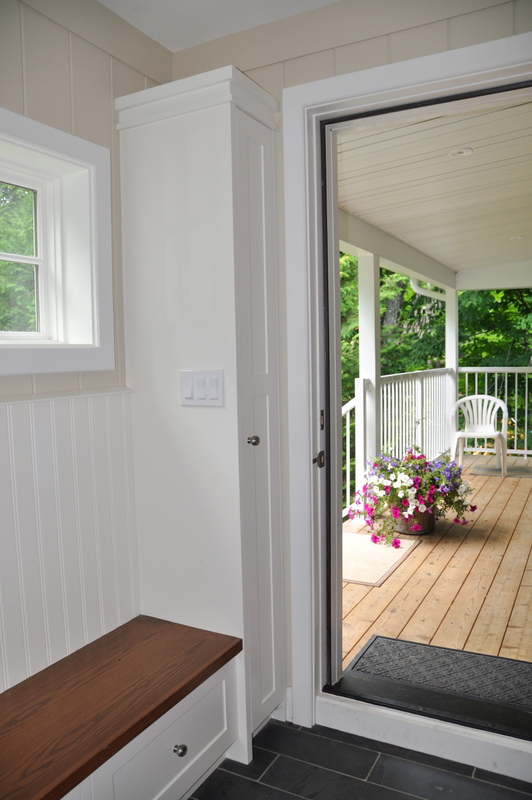 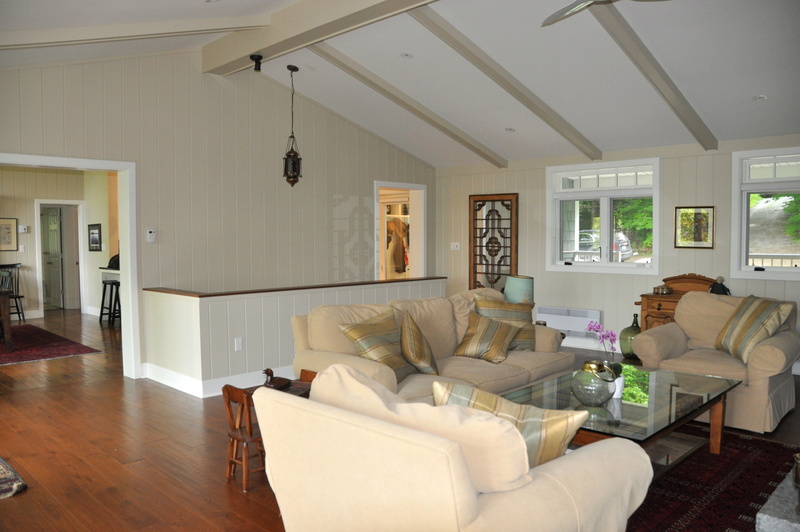 The covered rear porch offers a comfortable place to watch the kids enjoy the grassy play area. 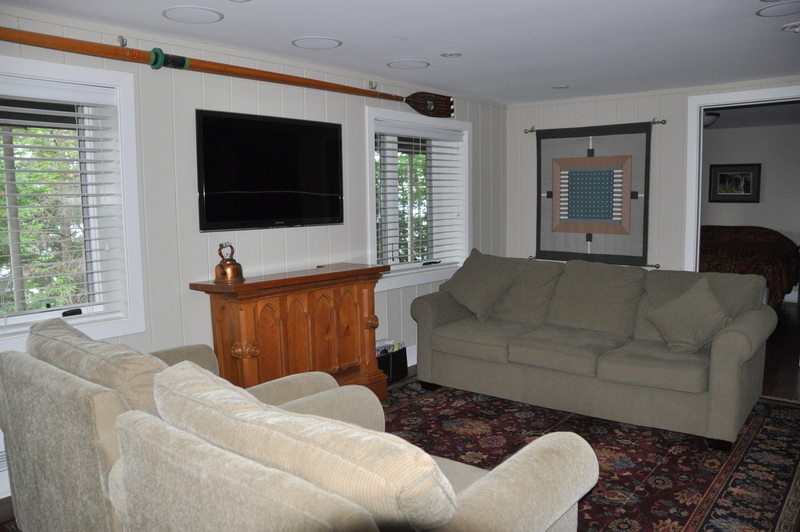 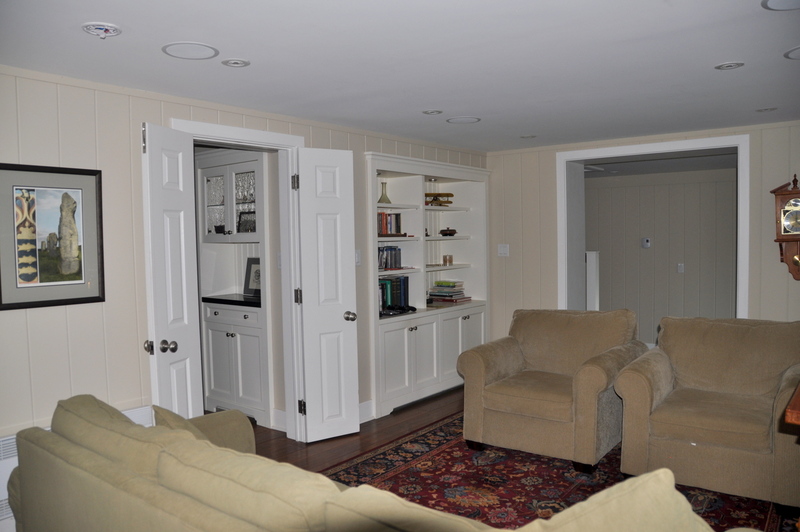 The finished basement features a family room with comfortable seating, a flat-panel television, and a built-in home theater sound system for watching DVDs—the combination perfect for providing kids with a bit of privacy from the adults. 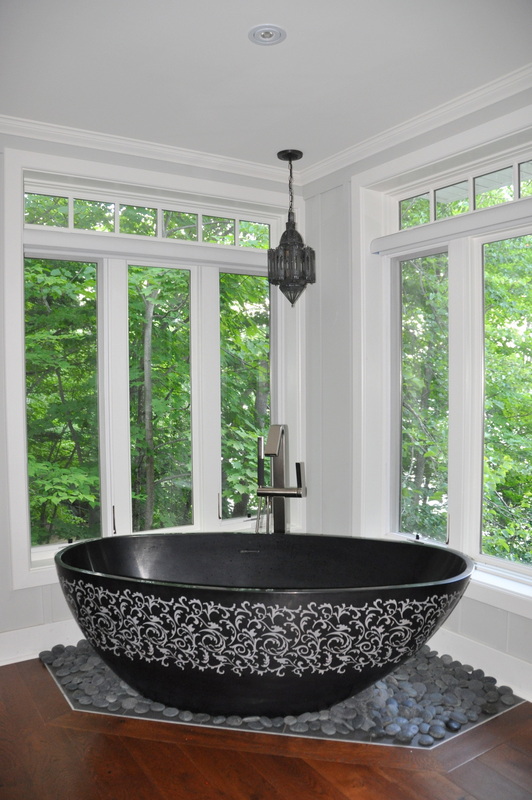 A spacious master bedroom suite includes a unique Blackstone soaker tub with views of the lake, an Asian-influenced ensuite with red lacquer vanity and unique floral basin, a striking cement tile floor, a rainforest shower, and walk-in closet. 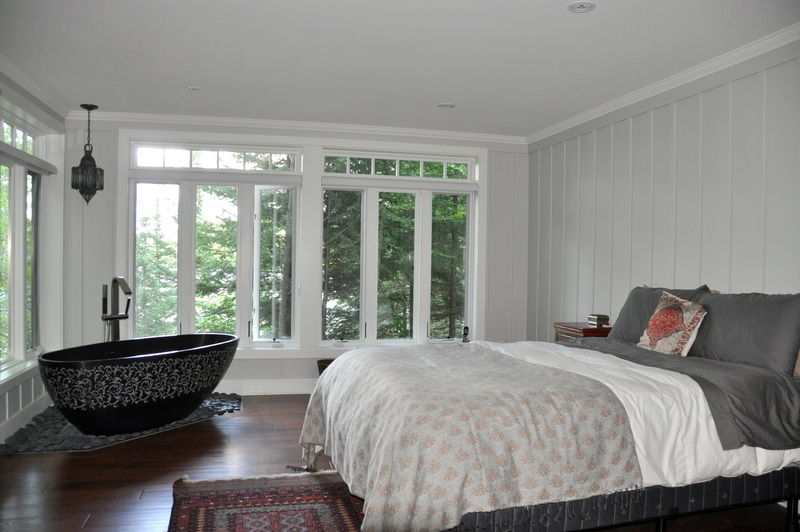 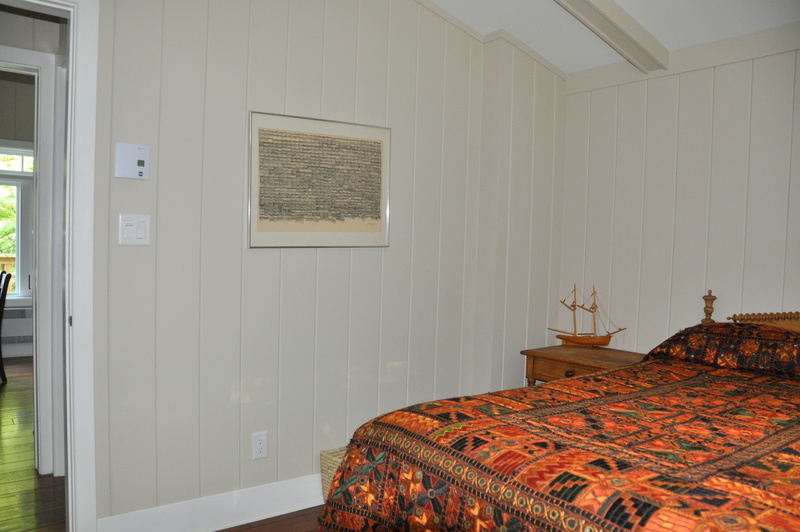 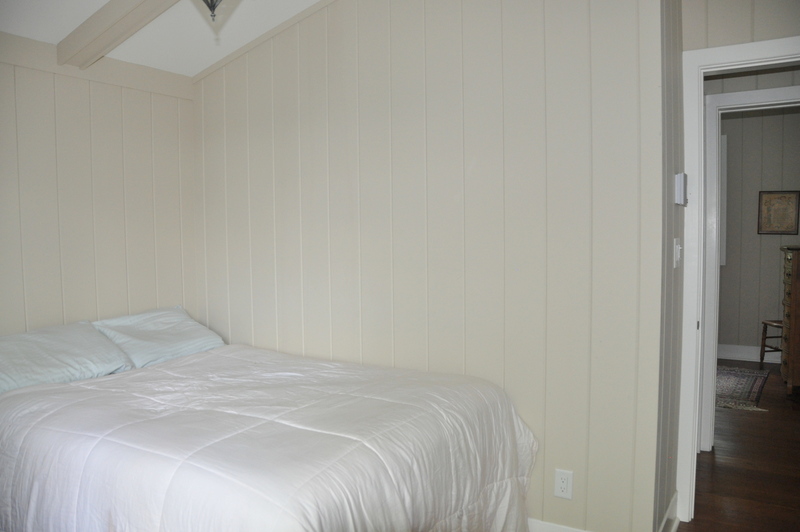 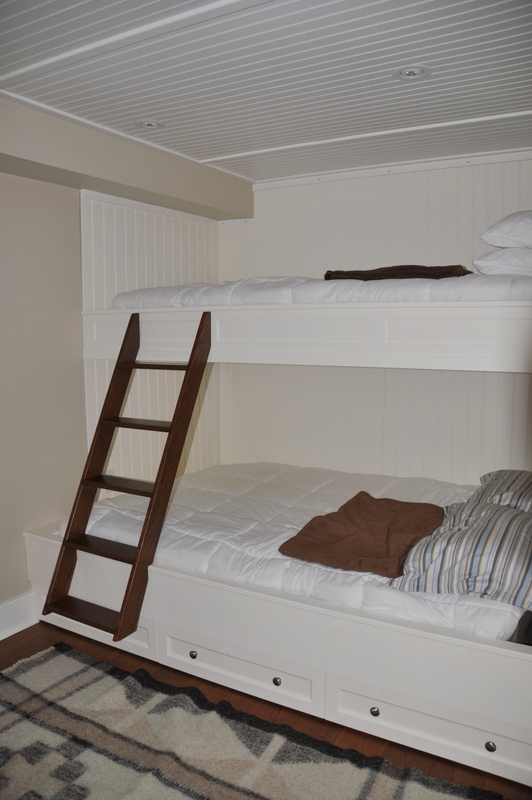 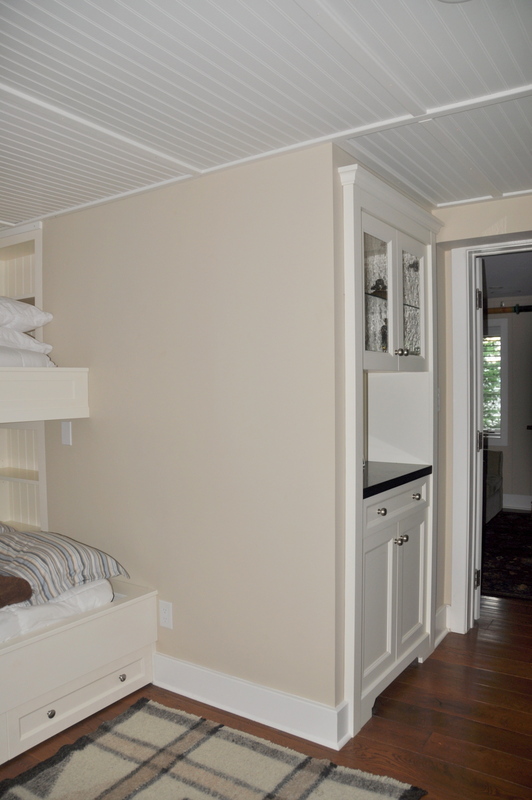 A fourth bedroom features a continued mix of antique furniture and Asian decorative pieces, while a cozy bunk room with built-in bunks, a spacious refrigerator for stocking up on food and beverage, and a bar cabinet offers comfortable sleeping space for three adults or a retreat for the kids. 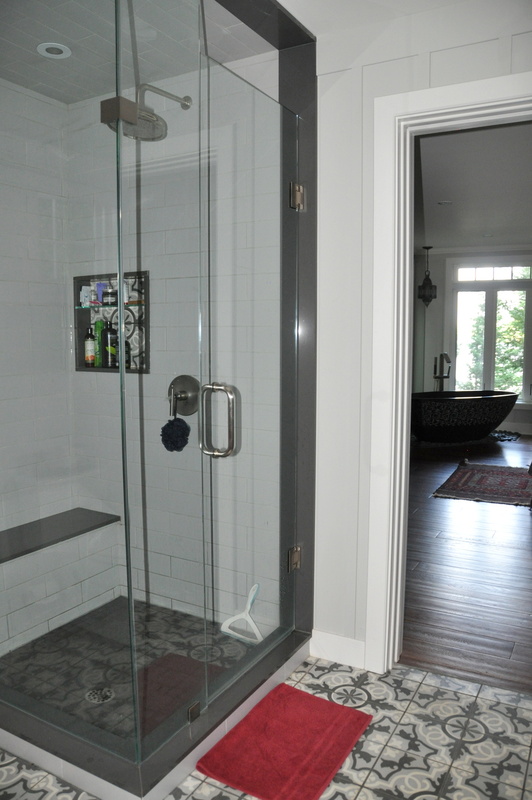 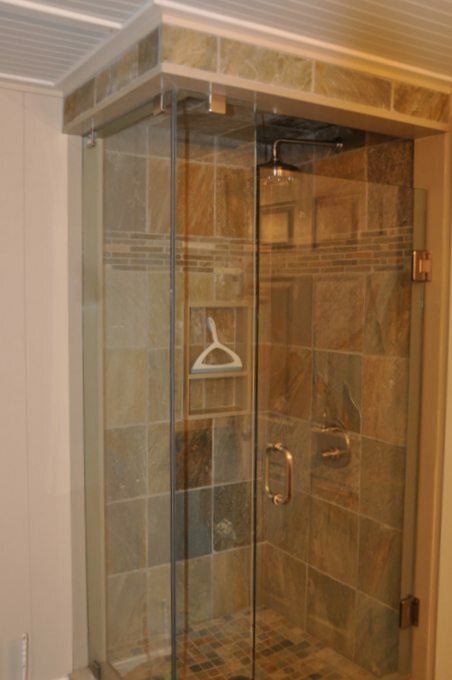 An additional three-piece bathroom includes a glass-walled rainforest shower and natural stone trim. 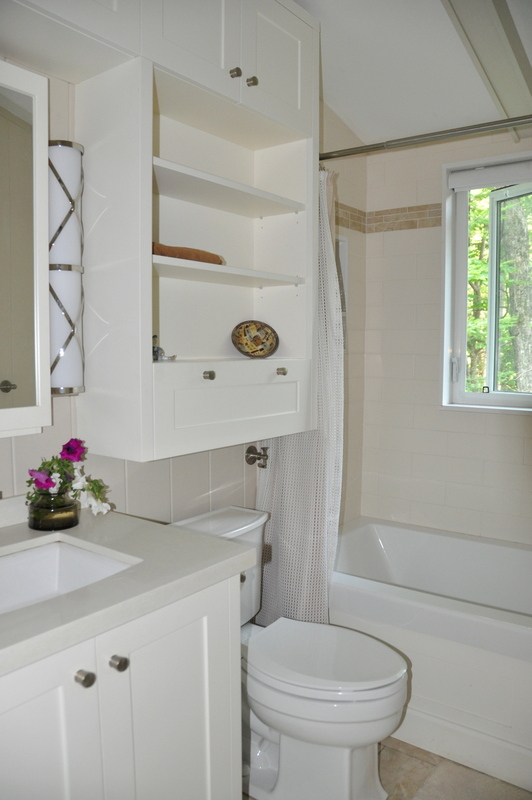 The service room houses a frontloading washer and dryer combination, the well water filtration and treatment system, and a built-in vacuum unit. 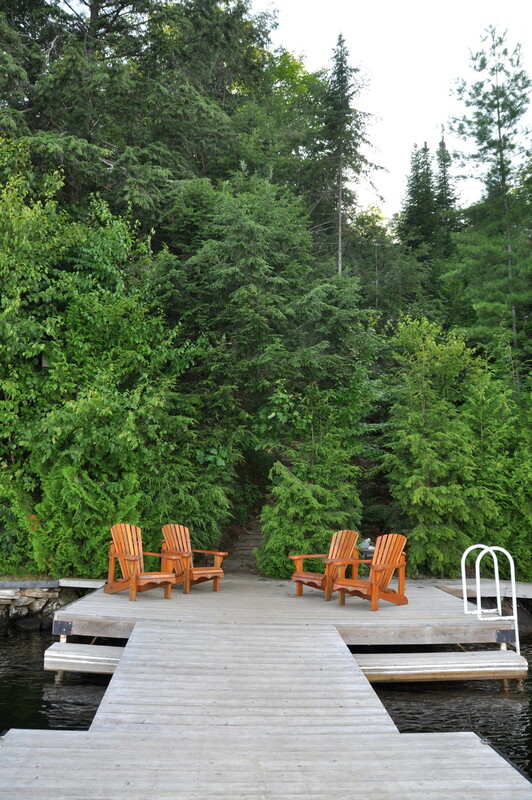 From the cottage, a pathway of approximately 55 steps leads down to the waterfront. 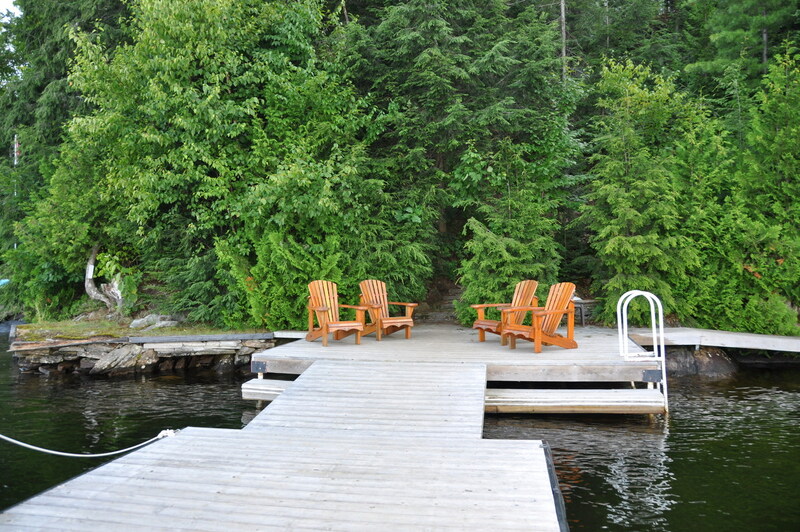 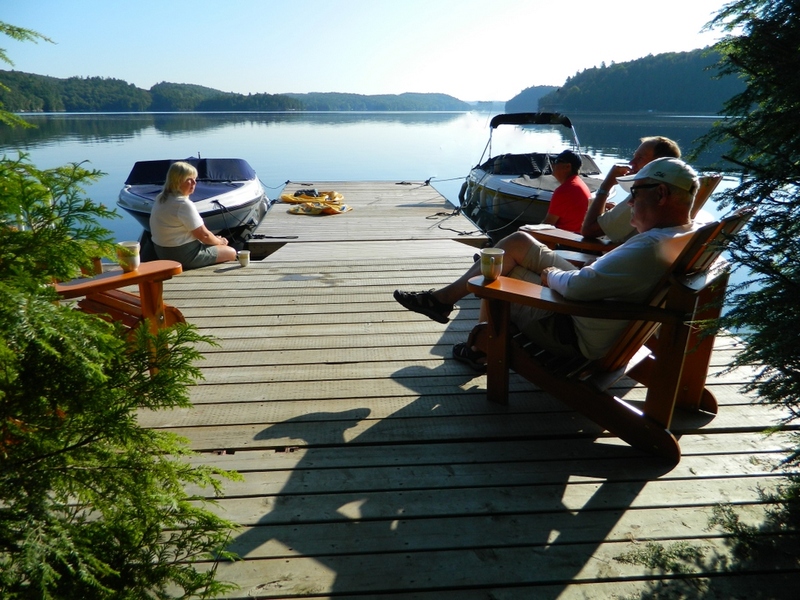 The platform dock with a ramp connecting it to a large floating dock is ideal for morning coffee, soaking up the sun's rays in Muskoka chairs, and waterfront entertainment by day, and marveling at the evening call of loons beneath a canopy of stars. 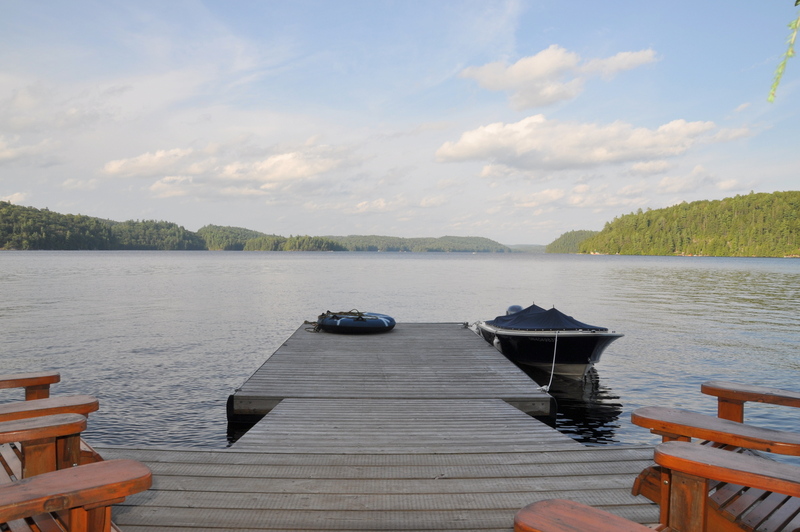 The shoreline platform dock includes a swim ladder and a convenient lower ledge off the front ends of the dock, from which to slip into the water for a refreshing dip. 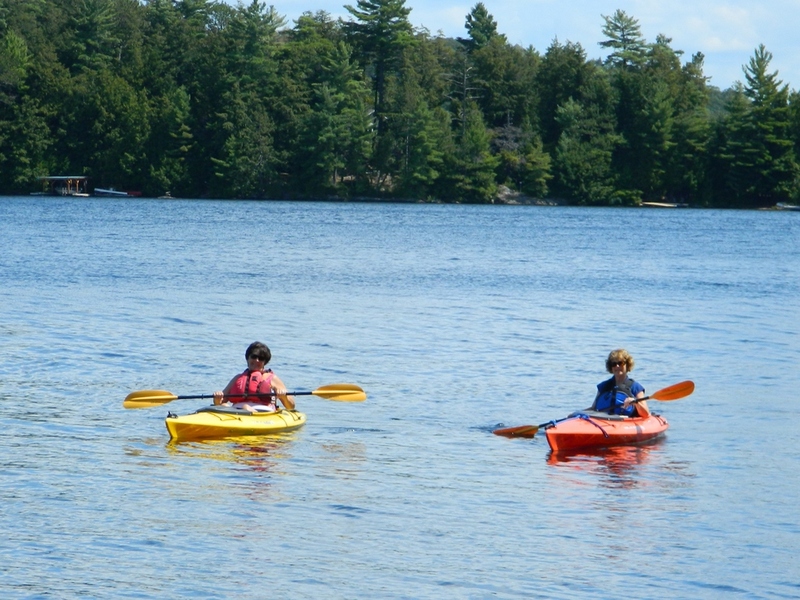 Use the three-seat family canoe, the paddleboat, or the two single-seat kayaks to explore the beauty and tranquility of the lake. 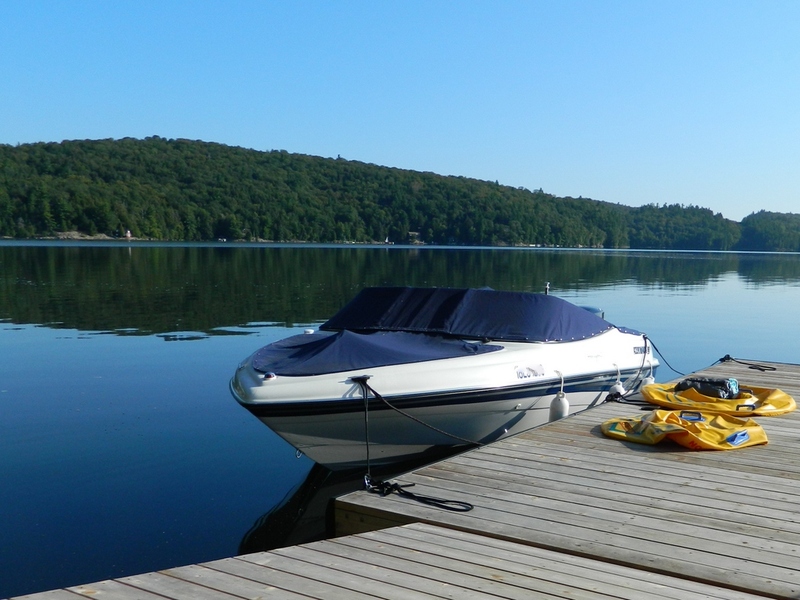 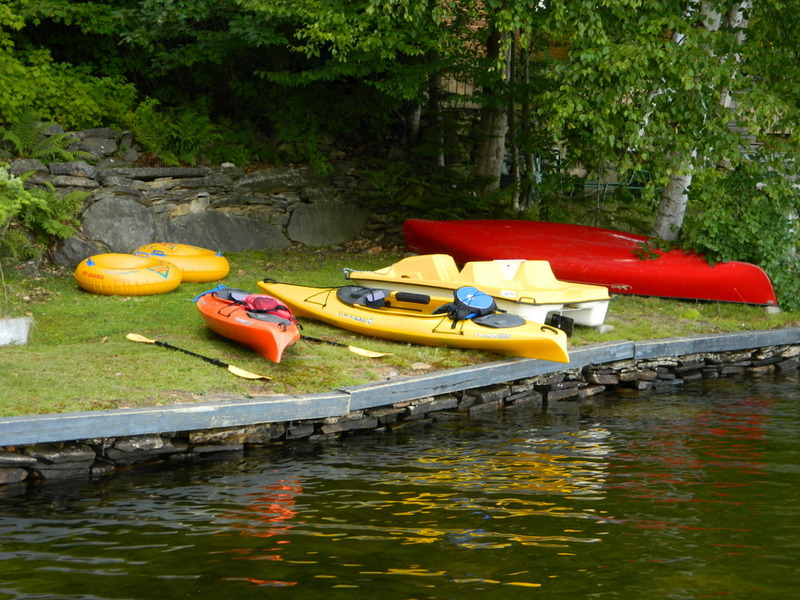 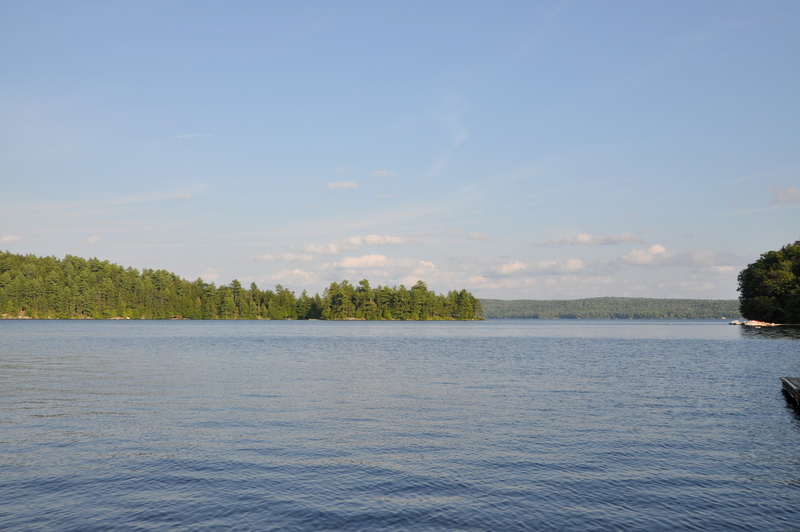 The large floating dock is an excellent place to tie up a boat (there are several boat launches on the lake for those who wish to bring their powerboat), and to catch the final hours of sun in the afternoon as the shoreline platform dock becomes shaded. 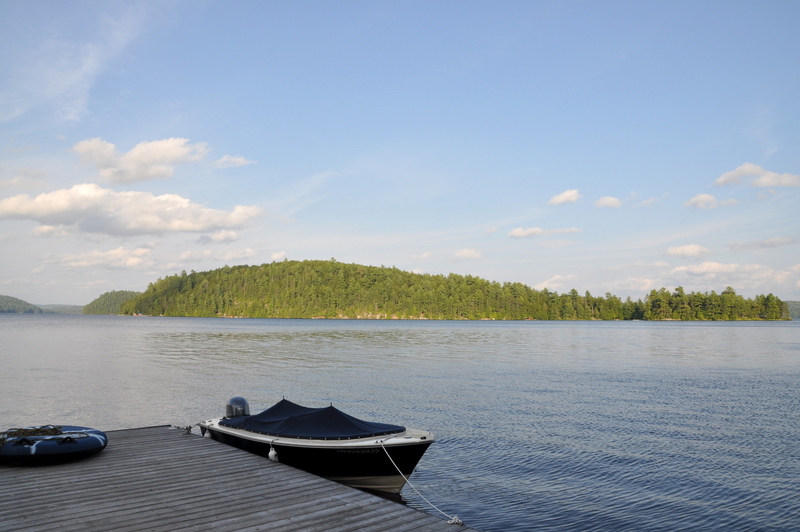 To one side of the dock a small point is perfect for casting a line, while a larger grassy area backed by natural cap rock on the opposite side is ideal for reading or an afternoon snooze. 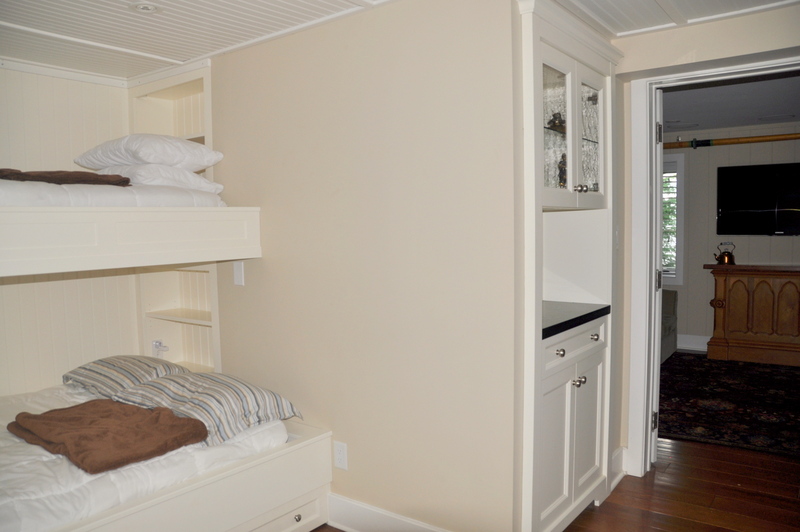 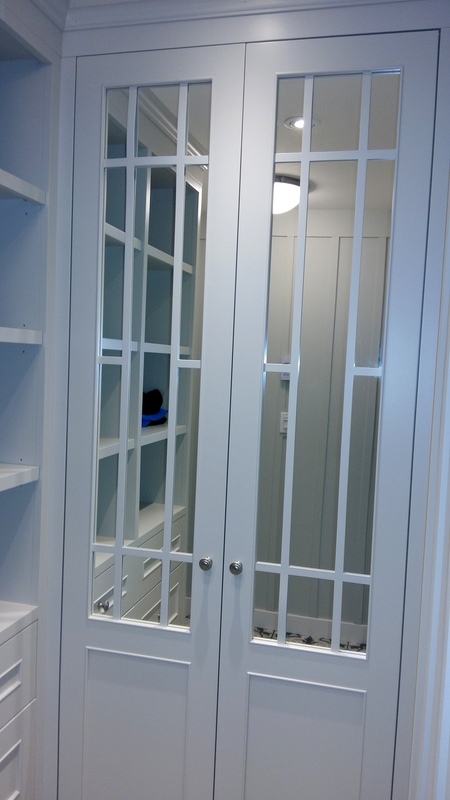 A small bunkie provides storage for paddles, fishing gear, and water toys and for changing for a swim. 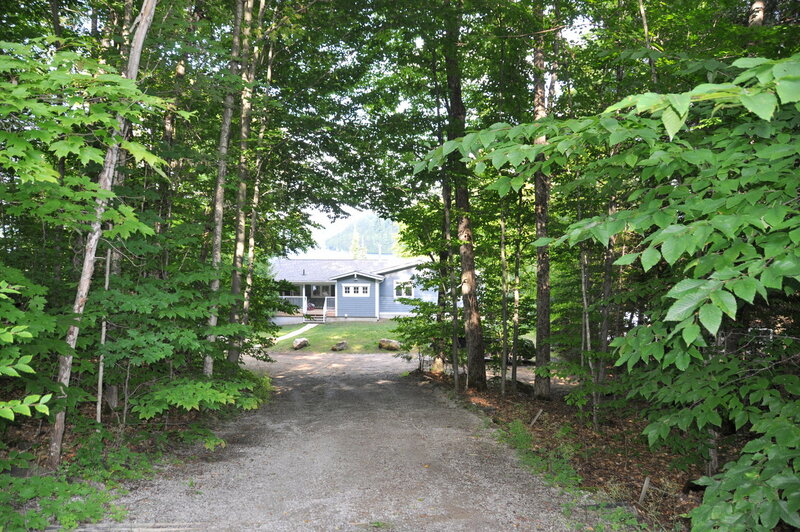 The driveway slopes down to the level parking area and grassy area that is gently sloped near the parking area and flattens towards the entrance of the cottage. 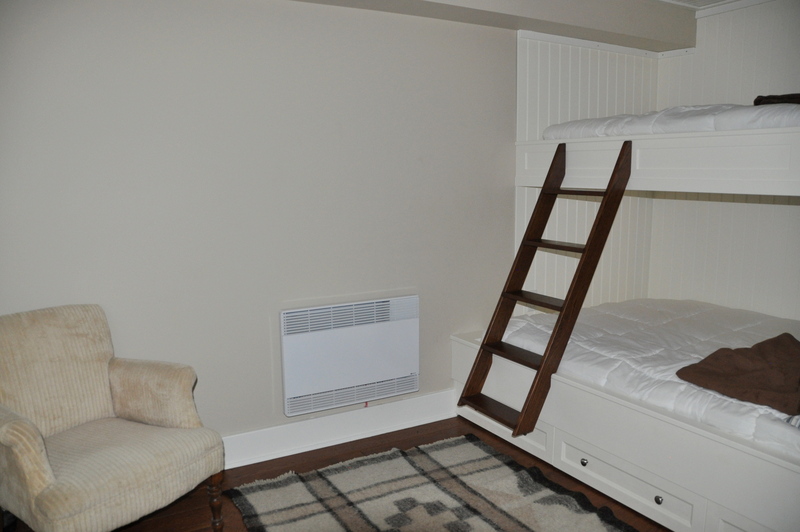 This provides a great play area for kids and easy access when loading and unloading vehicles. 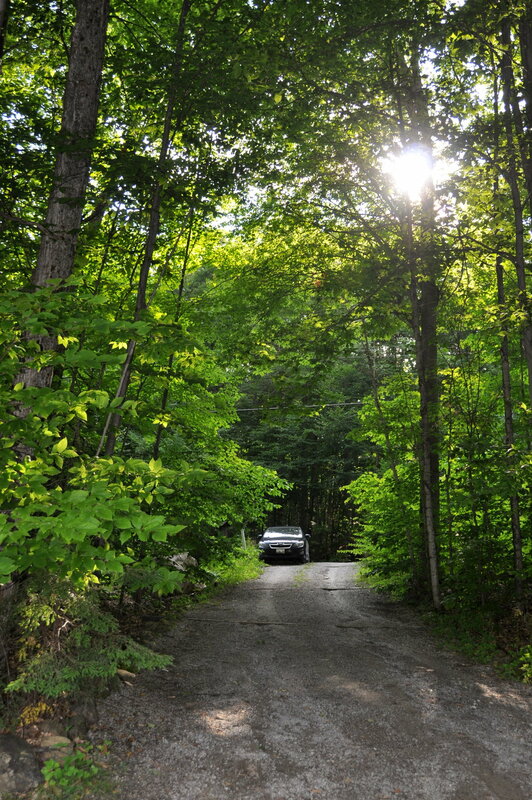 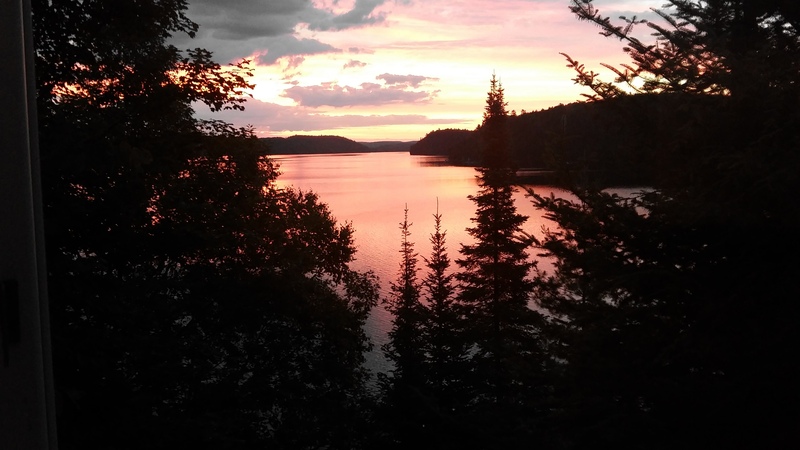 The pristine, forested neighborhood is a paradise for quiet walks to cliff-top vistas, the Hollow River, and Kawagama Lake Dam, exercise runs, mountain biking, and picking wild raspberries on the gravel road and trails that run through the crown land wilderness. 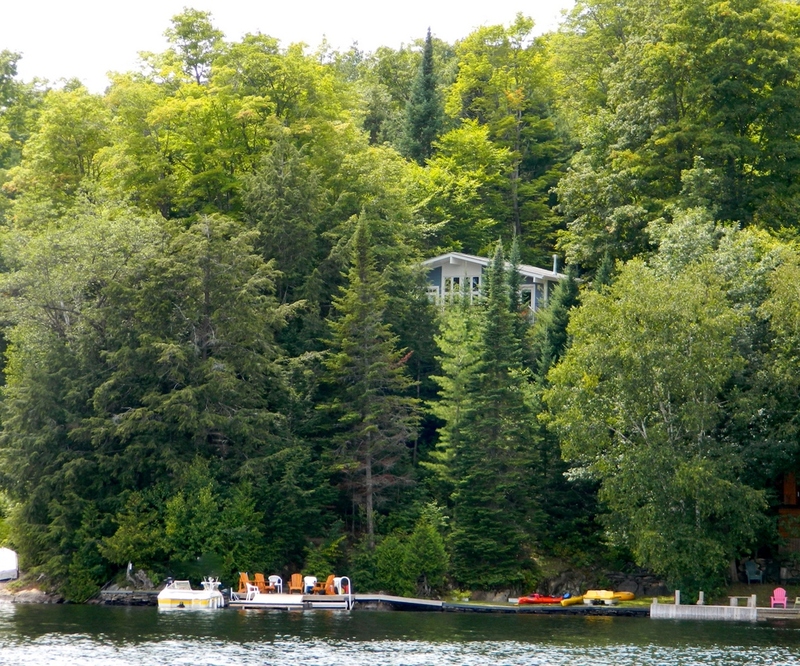 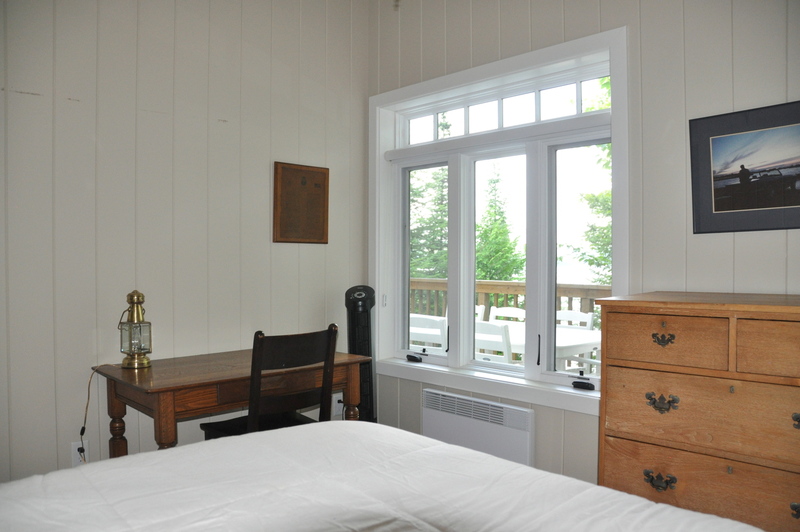 For your convenience, there will be a mandatory cleaning fee of $240 added to your bill so that you don't have to do a detailed cleaning yourself (you are still required to leave the cottage neat and tidy, as well as remove all your garbage and recycling). 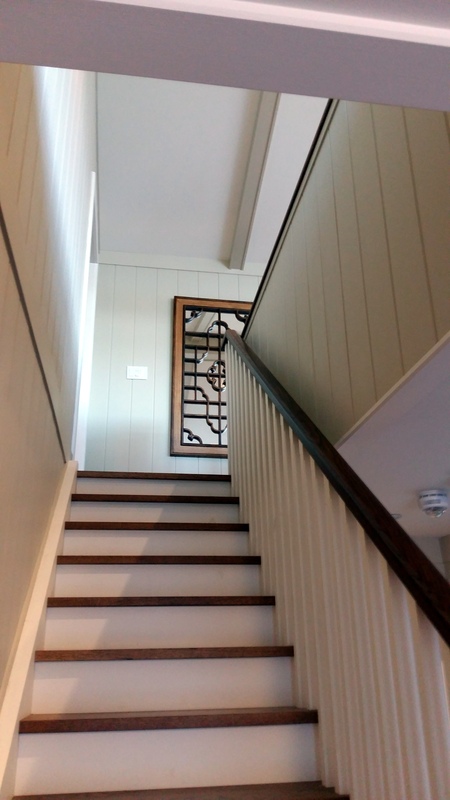 One dog upon approval, no smoking, maximum number of occupants is 10, bring own linens and towels, bring own drinking water, noise restriction after 11 PM. 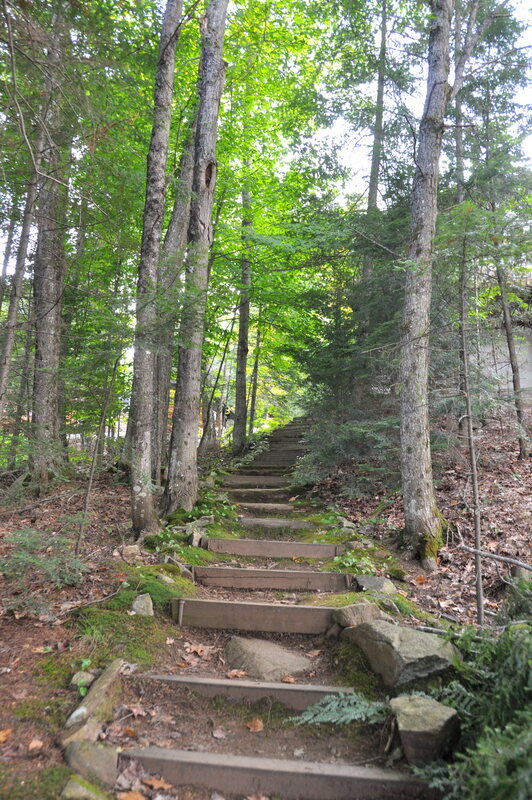 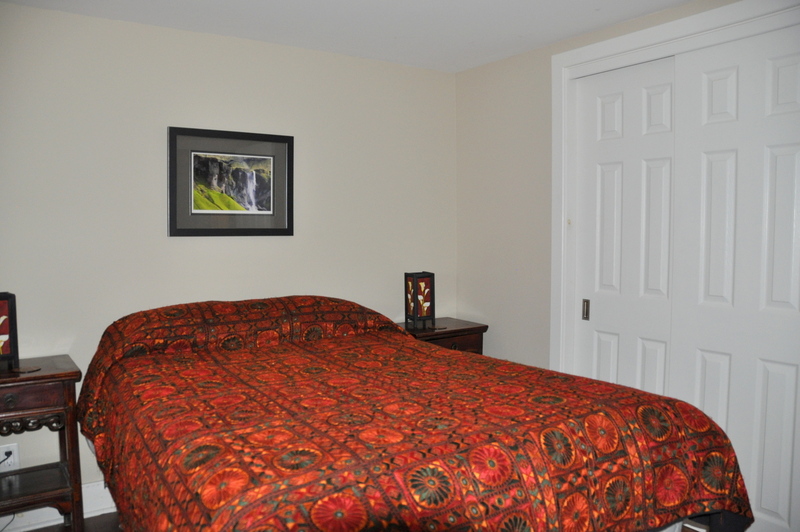 There are approximately 55 steps down to the waterfront area.